Japan's Nobunari Oda performs to Storm by the Yoshida Brothers at the 2010-11 Grand Prix Final of Figure Skating. Japan’s Nobunari Oda currently lead the men after the Short Program, followed closely by Patrick Chan of Canada and teammate Daisuke Takahashi. The main lesson of the Men’s Short Program competition in Beijing is ‘quads are back in fashion’ and they are in fact required in order to succeed. In recent years, skaters often opted for easier triple-triple combinations and clean programs, but the Senior Grand Prix Final showed that even outstanding performers such as Daisuke Takahashi cannot make up for a lower basic value of a program without a quad. Oda nailed his first ever quad toe loop – triple toe loop combination to earn 86.59 and leads the field ahead of Chan, whose attempt on the same combination was not successful. 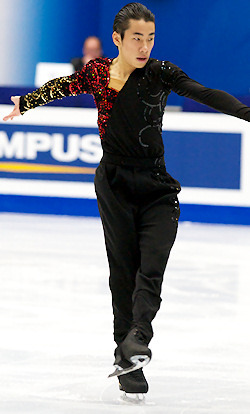 With two silver medals from autumn qualifying events, Oda was the second of six competitors to perform his short program. Right from the start it became evident that this was going to be the performance to beat. The student of Lee Barkell opened his routine to Storm by Yoshida Brothers with a nearly perfect quad-triple combination which earned +3.00 grade of execution from three judges and +2.00 from the remaining six. The only question was whenever the skater, who had been known for making weird mistakes in the past, would be able to keep the momentum. The question was promptly answered by an equally strong triple Axel and impressive spins, but the triple Lutz out of steps received an edge call which negated whatever bonuses he might have picked up for its solid landing. The name of Oda’s music was, in fact, the best way to describe his performance: highly charged. It was a never ending movement from one element to the next with no stops to regain a breath or disrupt the impression. The Japanese silver medalist, however, believed that he could have done even better. The decision to up the difficulty of the short program was reached after 2010 Skate America. Chan is another skater who has been recently persuaded that quads are necessary for success, however, he was not able to accomplish it this time. The landing of his opening jump was not secure enough and it was even marked as underrotated. Hence, the Canadian Champion decided against attempting a combination, and instead, added a triple toe loop to a triple flip later in the program. He received 85.59, loosing to Oda on the technical mark, but beating him in program component scores which reflected the relative choreographical intricacies of the two routines. The backup plan was worked out in advance. The skater is still very passionate about recently mastering the element. Takahashi laid out the most entertaining routine of the evening, but without a quad and with a stumble during a step sequence, he was only able to score 82.57 points. However, the 2010 Olympic bronze medalist was a class apart from the rest in a very strong field in terms of presentation. Even though the tango-themed program had almost all the required technical difficulty, including a strong triple Axel, it resembled an exhibition number more than a competitive routine. He presented it as such, paying at least as much attention to nuances of expression and hand gestures as he did to jump entrances and spins. This might, in fact, have been the reason why the spins received only a level three which further handicapped him in terms of basic value of the program. The Japanese champion said that he “wanted to try” to do a quad in the short program, but he is uncertain when he could do it. Meanwhile, he will attempt it in the long program. The third Japanese participant of the Final, Takahiko Kozuka, fought for the landing of his jump combination and triple Axel, and therefore hardly received any ‘bonuses’ for their execution. He also hit the boards towards the end of his straightline step sequence, which resulted in a moment of confusion and affected the overall impression of his smooth routine to Soul Man. The choice of music highlights his excellent basic skating skills, but in the field with so many accomplished performers, it is hard to fully appreciate his quieter and introvertic style. He earned 77.90 points. Tomas Verner (CZE)and Florent Amodio (FRA) both singled their planned triple Axels and are currently fifth (65.37) and sixth (61.64), respectively.